There are a lot of issues around the case of Sergei and Yulia Skripal which, at the time of writing, are very unclear and rather odd. There may well be good and innocent explanations for some or even all of them. Then again there may not. This is why it is crucial for questions to be asked where, as yet, there are either no answers or deeply unsatisfactory ones. Some people will assume that this is conspiracy theory territory. It is not that, for the simple reason that I have no credible theory — conspiracy or otherwise — to explain all the details of the incident in Salisbury from start to finish, and I am not attempting to forward one. I have no idea who was behind this incident, and I continue to keep an open mind to a good many possible explanations. Below are 30 of the most important questions regarding the case and the British Government’s response, which are currently either wholly unanswered, or which require clarification. 1. Why have there been no updates on the condition of Sergei and Yulia Skripal in the public domain since the first week of the investigation? 2. Are they still alive? 3. If so, what is their current condition and what symptoms are they displaying? His claim that “no patients have experienced nerve agent poisoning in Salisbury” is remarkably odd, as it appears to flatly contradict the official narrative. Was this a slip of the pen, or was it his intention to communicate precisely this — that no patients have been poisoned by a nerve agent in Salisbury? 5. It has been said that the Skripals and Detective Sergeant Nick Bailey were poisoned by “a military grade nerve agent”. According to some claims, the type referred to could be anywhere between five and eight times more toxic than VX nerve agent. Given that just 10mg of VX is reckoned to be the median lethal dose, it seems likely that the particular type mentioned in the Skripal case should have killed them instantly. Is there an explanation as to how or why this did not happen? 6. Although reports suggested the involvement of some sort of nerve agent fairly soon after the incident, it was almost a week before Public Health England issued advice to those who had visited The Mill pub or the Zizzi restaurant in Salisbury on the day that the Skripals fell ill. Why the delay and did this pose a danger to the public? Are baby wipes acknowledged to be an effective and safe method of dealing with objects that may potentially have been contaminated with “military grade nerve agent”, especially of a type 5-8 times more deadly than VX? 8. Initial reports suggested that Detective Sergeant Bailey became ill after coming into contact with the substance after attending the Skripals on the bench they were seated on in The Maltings in Salisbury. Subsequent claims, however, first aired by former Metropolitan Police Commissioner, Lord Ian Blair on 9th March, said that he came into contact with the substance at Sergei Skripal’s house in Christie Miller Road. Reports since then have been highly ambiguous about what should be an easily verifiable fact. Which is the correct account? 9. The government have claimed that the poison used was “a military grade nerve agent of a typedeveloped by Russia”. The phrase “of a type developed by Russia” says nothing whatsoever about whether the substance used in the Salisbury case was produced or manufactured in Russia. 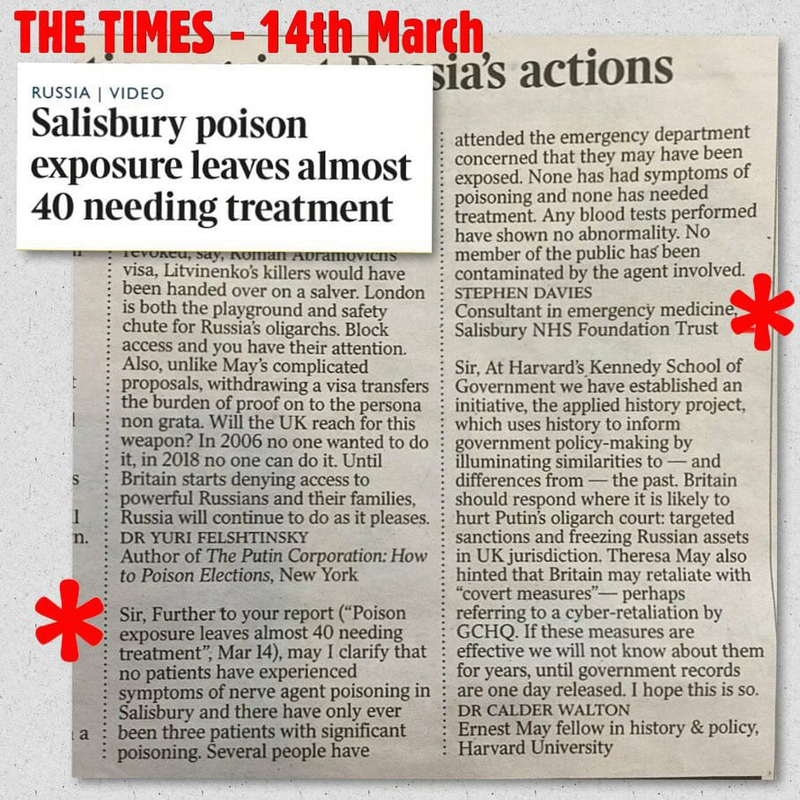 Can the government confirm that its scientists at Porton Down have established that the substance that poisoned the Skripals and DS Bailey was actually produced or manufactured in Russia? 10. The former ambassador to Uzbekistan, Craig Murray, has claimed that sources within the Foreign and Commonwealth Office (FCO) have told him that scientists at Porton Down would not agree to a statement about the place of origin of the substance, because they were not able to establish this. According to Mr Murray, only under much pressure from the Government did they end up agreeing to the compromise wording, “of a type developed by Russia”, which has subsequently been used in all official statements on the matter. Can the FCO, in plain and unambiguous English, categorically refute Mr Murray’s claims that pressure was put on Porton Down scientists to agree to a form of words and that in the end a much-diluted version was agreed? 11. On the occasion that the FCO did attempt to refute Mr Murray’s claims, the wording they used included a straightforward repetition of the same phrase – “of a type developed by Russia”. Is the FCO willing and able to go beyond this and confirm that the substance was not only “of a type developed by Russia”, but that it was “produced” or “manufactured” in Russia? 12. Why did the British Government issue a 36-hour ultimatum to the Russian Government to come up with an explanation, but then refuse their request to share the evidence that allegedly pointed to their culpability (there could have been no danger of their tampering with it, since Porton Down would have retained their own sample)? 13. How is it possible for a state (or indeed any person or entity) that has been accused of something, to defend themselves against an accusation if they are refused access to evidence that apparently points to their guilt? 14. Is this not a clear case of the reversal of the presumption of innocence and of due process? 15. Furthermore, why did the British Government issue an ultimatum to the Russian Government, in contravention of the Organisation for the Prohibition of Chemical Weapons (OPCW) rules governing such matters, to which both Britain and Russia are signatories, and which are clearly set out in Article 9, Paragraph ii of the Chemical Weapons Convention (CWC)? 16. Given that the investigation, which has been described by the man leading it as being “an extremely challenging investigation” and as having “a number of unique and complex issues”, and given that many of the facts of the case are not yet known, such as when, where and how the substance was administered, how is it possible for the British Government to point the finger of blame with such certainty? 17. Furthermore, by doing so, haven’t they both politicised and prejudiced the investigation? 18. Why did the British Government feel the need to come forward with an accusation little more than a week into the investigation, rather than waiting for its completion? Where has this intelligence come from and has it been properly verified? 20. If this intelligence was known before 27th September 2017 – the date that the OPCW issued a statement declaring the completion of the destruction of all 39,967 metric tons of chemical weapons possessed by the Russian Federation – why did Britain not inform the OPCW of its own intelligence which apparently contradicts this claim, which they would have had a legal obligation to do? 21. If this intelligence was known after 27th September 2017, why did Britain not inform the OPCW of this “new” information, which it was legally obliged to do, since it allegedly shows that Russia had been lying to the OPCW and had been carrying out a clandestine chemical weapons programme? Is the phrase “to the best of our knowledge” an adequate response to Mr Marr’s request of him being “absolutely sure”? 23. Is this a good enough legal basis from which to accuse another state and to impose punitive measures on it, or is more certainty needed before such an accusation can be made? 24. After hedging his words with the phrase, “to the best of our knowledge”, Mr Johnson then went beyond previous Government claims that the substance was “of a type developed in Russia”, saying that it was “Russian-made”. Have the scientists at Porton Down been able to establish that it was indeed “Russian-made”, or was this a case of Mr Johnson straying off-message? 25. He also went beyond the previous claim that the substance was “of a type developed in Russia” by saying that the substance involved in the Skripal case “falls within the category Novichok made only by Russia”? Firstly, is Mr Johnson able to provide evidence that this category of chemical weapons was ever successfully synthesised in Russia, especially in the light of the OPCW’s Scientific Advisory Board stating as recently as 2013, that it has “insufficient information to comment on the existence or properties of ‘Novichoks‘“? 26. As Craig Murray has again pointed out, since its 2013 statement, the OPCW has worked (legally) with Iranian scientists who have successfully synthesised these chemical weapons. Was Mr Johnson aware that the category of “Novichok” chemical weapons had been synthesised elsewhere when he stated that this category of chemical weapons is “made only by Russia”? 27. Does the fact that Iranian scientists were able to synthesise this class of chemical weapons suggest that other states have the capabilities to do likewise? 28. Is the British Government aware that the main plant involved in attempts to synthesise Novichoks in the 1970s and 1980s was based not in Russia, but in Nukus in Uzbekistan? 29. Does the fact that the US Department of Defence decontaminated and dismantled the Nukus site, under an agreement with the Government of Uzbekistan, make it at least theoretically possible that substances or secrets held within that plant could have been carried out of the country and even back to the United States? 30. The connection between Sergei Skripal’s MI6 recruiter, Pablo Miller, who also happens to live in Salisbury, and Christopher Steele, the author of the so-called “Trump Dossier”, has been well established, as has the fact that Mr Skripal and Mr Miller regularly met together in the City. Is this connection of any interest to the investigation into the incident in Salisbury? If there are any journalists with integrity and inquisitive minds still living in this country, I would be grateful if they could begin doing their job and research the answers to these sorts of questions by asking the appropriate people and authorities.